Little Women begins with four young women trying to make the most of their Christmas in New England while their father is away fighting in the Civil War. Too poor for any presents, the girls use creative, convicting generosity to overcome not only this, but other testing circumstances, aided by the benevolence of their wealthy, elderly neighbor and his adventurous grandson. This is one of the rarest types of novels, dealing honestly with each character throughout adulthood. It sympathizes with their vices and joys, both individually and as a family to which we all would wish to belong. This story will make you long for the advice of an astute, patient mother like Marmee; for a compassionate hug from a deeply empathetic, gentle sister like Beth; and to write, paint, and live splendidly as each girl inevitably did, despite the frustrating burden of maturity that their poverty thrust upon them. With “humor, pathos,” and wisdom from varied personalities and circumstances, Little Women evokes nostalgia for a childhood which we can only revisit upon its pages. Also by Louisa May Alcott are several novels such as Jack and Jill and Eight Cousins, the sequels to Little Women: Jo’s Boys and Little Men, and books of short stories: A Whisper in the Dark, and From Jo March’s Attic: Stories of Intrigue and Suspense. There are also many others which can be found at your local bookstore. If you love timeless literary classics written by women about women, read Jane Eyre by Charlotte Bronte or Pride and Prejudice by Jane Austen. If you like young women’s coming-of-age, family-centered stories, try I Capture the Castle by Dodie Smith, First Frost by Sarah Addison Allen, or The Witch of Blackbird Pond by Elizabeth George Speare. Mr. Bhaer is notorious for carrying various treats in his pockets for the children he adores. One of those is frequently oranges. Near the end of the novel, he also desires to buy something for Jo’s family as a gift for having dinner at their home. He purchases oranges, figs, and other fruits. I chose these ingredients to make a recipe that was like Mr. Bhaer: soothing, subtle, but bold at the right moments. 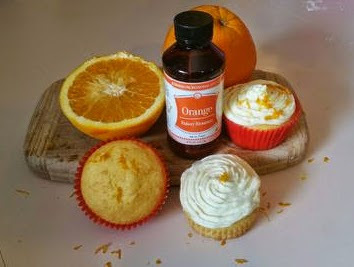 Mix together cupcake ingredients according to box, adding the zest of one orange, and 2 tbsp plus one tsp of the orange emulsion (or removing 1/4 of the water and substituting orange juice). Bake according to directions on the box. I used a muffin tin, and the cupcakes bakes for roughly 22 minutes in my oven, but oven times will vary. Make sure you check their doneness with a toothpick. If it comes out goopy, bake them for a few more minutes. If it comes out clean or with only a few dried crumbs, the cupcakes are done.Once the cupcakes have cooled at least ten minutes, begin frosting them. To make the frosting, gently beat softened butter in a large bowl. If you forgot to put your butter out to soften, you can melt it in the microwave for ten to twenty seconds, depending on power settings. Just check it to make sure it hasn’t melted. Slowly add a cup at a time of powdered sugar, alternating with 1-2 tbsp of the liquid (milk is preferred over orange juice). Look for a soft, creamy texture. If the frosting is too clumpy, add a tbsp more milk. If it is too runny, half the amount of liquid. Halfway through the process of alternating powder with liquid, add the sugar, then the zest of half the second orange, the juice of half an orange, and one tablespoon of emulsion- these should replace the liquid you would have added at the next step. Do not add milk (or OJ) plus all of these. Then go back to adding powdered sugar, and liquid if necessary. You might not need any more liquids after this point, if the frosting looks firm. When frosting cupcakes, always test one, then wait a few minutes to make sure they are cool enough that your frosting doesn’t melt. If after 5 minutes the frosting is still upright, continue to frost the rest of your cupcakes. Garnish them with a little more orange zest and a fig, if you’d like. Or just eat them as is. 1. The girls’ mother often re-set them into a positive mood in a myriad of ways. One of those ways was to nod and smile at them out of the window before they left for the day’s duties. Why would such a small ritual comfort and encourage them? What rituals do we or should we continue as parents or for our spouses? 2. 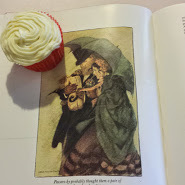 Jo observes that there “are many Beths in the world, shy and quiet, sitting in corners til needed, and living for others so cheerfully that no one sees… til the sweet presence vanishes.” Do you know any? Why do there always seems to be people like this, untainted by life’s extreme passions, like Jo and Amy, and more of a calming spirit in the household? Does every family seem to have someone like this, and why is she so necessary in their home? 3. Beth’s granted wish to play the grand piano in Mr. Laurence’s home turned out to be all she had hoped for, perhaps “because she was so grateful for this blessing that a greater was given her.” What is it that makes the things we’ve looked forward to so often disappointing once had, and why was this not the case for Beth? 4. Jo fears her dreadful temper is her worst flaw and greatest adversary, and is shocked when Marmee reveals that she suffers from the same affliction. What were the tricks Marmee used to control herself, and who aided her? Is it really possible that Marmee struggled just as badly, and that a lifetime’s efforts were what made her into the seemingly patient woman the girls knew? Do you believe Jo conquered her temper in the same way in her old age, or would it have taken a different strategy for her? 5. Was it foolish of Meg to be caught up the pressure of her peers, especially Sally Moffatt, when Meg’s “sensible resolution to be contented with the simple wardrobe…of a porr man’s daughter was weakened by the unnecessary pity of the girls? Girls “who thought that a shabby dress was one of the greatest calamities under heaven.” Does that prove those girls to be shallow or sheltered? What, aside from poverty, made Meg more mature and realistic about life’s potential? But then what, so often, dragged her back into the allure of materialism? 6. When Beth was horribly ill , nearly dying, and delirious with fever and Jo’s parents were both away, Laurie “stood silent, gently stroking Jo’s bent head.” Why did she say it was the best thing he could do, and far more soothing than the most eloquent words”…as she “learned the sweet solace which affection administers to sorrow”? What sort of affection is she referring to? (hint: look up storge). How is it that sometimes in great sorrow, words are insufficient, but a touch or a hug are hugely meaningful? 7. When Amy felt overwhelmed at having to live with old Aunt March, she made herself a little chapel. Marmee observed that “It is an excellent plan to have someplace where we can go to be quiet, when things vex or grieve us.” Is this true for everyone, or just introverts? What makes people choose different types of places, their personality, or their mood perhaps? Marmee also talked about her appreciation of Amy asking for help in the right way- what did she mean by that? 8. Jo and Laurie both have similarly stubborn tempers. As a result, Jo gives some advice to Mr. Laurence that “…a kind word will govern me when all the king’s horses and all the king’s men couldn’t.” Why is that her and Laurie’s triggers to calm and refocus their energy? How could the opposite only escalate the situation? Is that one of the reasons why they would be terrible together as a married couple? 9. “Now and then, in this work-a-day world, things do happen in the delightful storybook fashion.” For the Marches, it was Mr. March’s return at Christmas. Were there any other moments in this novel that seemed like a delightful storybook? Do those happen in our lives as well, and would it be wise to record some of them for our harder days, as was sort of done with the writing of this novel? 10. Meg made her own wedding gown, and her only ornaments were her favorite flowers in her hair. Was this why she, unlike many modern brides, told her family to “hug and kiss me everyone, and don’t mind my dress; I want a great many crumples of this sort put into it today”? Would we have fewer Bridezillas if they took a lesson from Meg in appreciating the value of the day over their own appearance or expectations? What was i that gave Meg this mentality-was it her time period, upbringing, character, or something else? 11. Would you say Mrs. March was a wise mother or a cold one, when it came to the situation with Amy going to great lengths to impress her wealthy female artist friends, and Marmee’s perspective that “experience was an excellent teacher, and when it was possible she left her children to learn alone the lesson which she would gladly have made easier”? 12. Jo’s writing came in long fits, in which she might neglect food or even sleep, for days on end. How is this similar to the actual author, especially in the penning of this great novel? Do any other writers in history share this mania? What about artists? How would this have been affected if she were older, or married, or had children? Do you believe many writers are squelched with the duties of running a household, or does genius find a way, as it did for Jo? 13. Was it encouraging for you to read the account of Meg’s young marriage spats with her husband, John, or did you think them foolish children who merely needed to let go of their pride? Do all young married couples go through such times, and is one of the tricks to learn to overcome these challenges? And what about the choice they made to not share the details of their quarrels with their families-how could this be both a wise and unwise decision? 14. Was there any marriage advice we could take away from Marmee’s speech to Meg about her quarrel with John (such as not waking his anger, not deceiving him with a look or word, keeping his respect to maintain peace, being the first to ask pardon, or guarding against little misunderstandings or hasty words)? Later, the story tells that they discovered the key to household happiness “…unlocking the treasuries of real home-love and mutual helpfulness.” Do those keys lie in the advice they were given, or Meg’s realization that her highest honor was the art of ruling her home, “not as a queen, but as a wife and mother”? 15. “Simple, sincere people seldom speak much of their piety; it shows itself in acts…and has more influence than…protestations. Beth could not reason upon or explain the faith that gave her courage and patience to give up life, and cheerfully wait for death.” What was it that made her this way-was it because she had never dreamt of leaving their childhood home for her own adventures, as her sisters had, or was it the kind and gentle nature of her character, or had she just somehow learned to accept the inevitability of her fate? Do you know anyone else who has passed away like this, and is that something you aspire to? 16. Why were the hours of nursing Beth before her death, for Jo, “precious and helpful hours, for now her heart received the teaching that it needed; lessons in patience were so sweetly taught her that she could not fail to learn them; charity for all, the lovely spirit that can forgive and truly forget unkindness, the loyalty to duty that makes the hardest easy, and the sincere faith that fears nothing, but trusts undoubtedly”? Why did it take death to break and mold her into a better person? Why and how can it do the same for us? 17. Laurie admits that he was selfish and lazy, and feels that, “when a man has a great sorrow, he should be indulged in all sorts of vagaries til he has lived it down.” How does this revelation give us greater insight into his true nature, and does this prove that he makes a better man for Amy than he ever would for Jo? Why? 18. Almost autobiographically, Jo’s novel is greatly praised because, “There’s truth in it…humor and pathos make it alive” and she has found her personal style. Are these the things that make literature great? Are they for this story as well? Great story. Love the questions that help you search deeper into family relationships and understanding people.